US, Saudi Arabia, and Israel have conspired to destroy Syria by way of arming sectarian extremists since 2007. The West now admits it, along with Saudi Arabia and Qatar, have provided thousands of tons of weapons to militants in Syria - while also conceding that Al Qaeda's Syrian franchise, Jabhat al-Nusra is the best armed, most well equipped militant front in the conflict. US, Saudi, Israeli-backed terrorists are now committing a myriad of horrific atrocities against all of Syria's population, including Sunni Muslims - meaning neither "democracy" nor even "sectarianism" drives the conflict, but rather the destruction of Syria in its entirety. 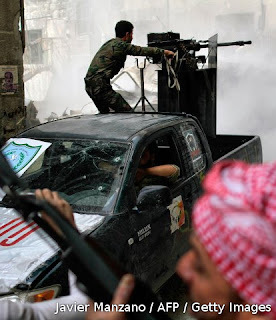 US State Department acknowledges Syria faces threat from Al Qaeda, demands blockade of arms/aid from reaching government to fight terrorists the US State Department admits are present in every major Syrian city. March 30, 2013 (LD) - Since 2007, the US, Saudi Arabia, and Israel have been documented as conspiring to overthrow the Syrian government by way of sectarian extremists, including groups "sympathetic to Al Qaeda," and in particular, the militant, sectarian Muslim Brotherhood. While the West has attempted to portray the full-scale conflict beginning in Syria in 2011 as first, a "pro-democracy uprising," to now a "sectarian conflict," recent atrocities carried out by US-Saudi-Israeli proxies have shifted the assault to include Sunni Muslims unable or unwilling to participate in the destruction of the Syrian state. Such attacks included a mortar bombardment of Damascus University, killing 15 and injuring dozens more, as well as the brutal slaying of two prominent Sunni Muslim clerics - the latest of which was beheaded, his body paraded through the streets of Aleppo, and his head hung from the mosque he preached in. While the West attempts to mitigate these events by labeling the victims as "pro-government," the reality is that the forces fighting inside Syria are funded, armed, directed, and politically supported from abroad - and therefore do not represent any of the Syrian people's interests, including those Syrians who do not support the government. It is abundantly clear that the West's goal is neither to institute "democracy," nor even take sides in a "sectarian conflict," but rather carry out the complete and permanent destruction of Syria as a nation-state, sparing no one, not even Sunnis. Such a proxy war exists contra to any conceivable interpretation of "international law." The world is left with a moral imperative to not only denounce this insidious conflict brought upon the Syrian people, compounded and perpetuated entirely by external interests, but demands that concrete action is taken to ensure that this act of aggression is brought to an end. The US, UK, Saudi Arabia and Qatar have admitted to colluding together, flooding Syria with thousands of tons of weapons via Jordan to Syria's south, and NATO-member Turkey to Syria's north. And in an otherwise inexplicable conundrum, while the likes of US Secretary of State John Kerry insist this torrent of weapons is being directed to "moderates," neither the US nor its allies are able to explain why Al Qaeda terror front Jabhat al-Nusra has emerged as the most heavily armed, best equipped militant organization in the conflict. US Secretary of State John Kerry said on the sidelines of a Syrian opposition meeting in Italy last month that the weapons are ending up in the hands of secular groups. "I will tell you this: There is a very clear ability now in the Syrian opposition to make certain that what goes to the moderate, legitimate opposition is in fact getting to them, and the indication is that they are increasing their pressure as a result of that," he said, without elaborating. Image: (Left) West Point's Combating Terrorism Center's 2007 report, "Al-Qa'ida's Foreign Fighters in Iraq" indicated which areas in Syria Al Qaeda fighters filtering into Iraq came from. The overwhelming majority of them came from Dayr Al-Zawr in Syria's southeast, Idlib in the north near the Turkish-Syrian border, and Dar'a in the south near the Jordanian-Syrian border. (Right) A map indicating the epicenters of violence in Syria indicate that the exact same hotbeds for Al Qaeda in 2007, now serve as the epicenters of so-called "pro-democracy fighters" and also happen to be areas the US CIA is admittedly distributing weapons and other aid in. Such a reality directly contradicts the US State Department's official position, and no explanation is given as to how "moderates" can be provided with such extensive support, and still be eclipsed militarily and logistically by terror-front al-Nusra. That is, unless of course, the US, British, Saudi, and Qatari weapons aren't simply just handing the weapons directly to terrorists, precisely as planned as early as 2007. The Wall Street Journal in 2007 would also implicate the Muslim Brotherhood and more specifically, the so-called "National Salvation Front," in its article, "To Check Syria, U.S. Explores Bond With Muslim Brothers." It is clear that the US, Saudi Arabia, and Israel planned to use sectarian extremists against the nation of Syria starting at least as early as 2007, and it is clear that now these sectarian extremists are carrying out the destruction of Syria with a massive torrent of weapons and cash provided by the US and its regional allies, just as was described by Hersh's report. Syria is under attack by an insidious, premeditated foreign assault, intentionally using terrorist proxies in direct and complete violation of any conceivable interpretation of both national and international law. The world has a moral imperative to support the Syrian people and their government as they fight this assault - both politically and logistically. While US Secretary John Kerry is unable to account for how his nation's support for moderates has left Al Qaeda's al-Nusra front the premier militant faction in Syria, he has demanded that Iraq help stem the flow of alleged aid Iran is providing the Syrian government as it fights these terrorists. Does US Secretary of State John Kerry deny that Syria is fighting a significant (and continuously growing) Al Qaeda presence within their borders, which according to the US State Department's own statement, is operating in every major city in the country? What conceivable explanation or excuse could be made to justify the blockading of aid sent to Syria to fight Al Qaeda terrorists? In fact, why isn't the US aiding the Syrian government itself in its fight against Al Qaeda - a terrorist organization the US has used as an excuse to wage unending global war since 2001 when Al Qaeda allegedly killed some 3,000 American civilians? The leader of Syria's opposition coalition urged the United States on Wednesday to review its decision to designate the militant Islamist Jabhat al-Nusra as a terrorist group, saying religion was a legitimate motive for Syrian rebels. "The decision to consider a party that is fighting the regime as a terrorist party needs to be reviewed," Mouaz Alkhatib told a "Friends of Syria" meeting in Morocco, where Western and Arab states granted full recognition to the coalition seeking to oust President Bashar al-Assad. The US is directly responsible for the emergence and perpetuation of Al Qaeda and other extremist groups in Syria. The statements of Secretary John Kerry are made merely to maintain an increasingly tenuous "plausible deniability." The precedent being set by the US and its allies is one of using full-scale proxy invasions, that if successful in Syria, will be directed into Iran, up through the Caucasus Mountains in Russia, and even onto China's doorstep via extremists the West is cultivating amongst the Uighurs. It is also clear that the West is directly responsible for the extremists within their own borders, and that these extremists are being used as a political tool against the people of the West, just as they are being used as a mercenary force abroad. A united front between nations against this wanton state sponsorship of terrorism is needed - with nations pledging political and logistical support to the Syrian people to defeat this open conspiracy. Individually, we can identify, boycott, and permanently replace the corporate-financier interests who conceived of and are driving this agenda. Failure to stop such wide scale criminality against the Syrian people now, will only invite greater criminality against us all in the near future.